Weekend warriors take on many forms. In my case, I used to reserve the weekends for cooking projects. There will be a batch of Morado Jam in my near future as soon as the first Concord grapes hit the farmer’s market. Even if my once prodigious-to-me preserving has taken a bit of a backseat, can we reflect on the idea that cooking during the weekend looks a little bit different from weeknight meals? Perhaps the time is looser and not quite so structured. Maybe you regularly invite friends over for long, leisurely meals sobre mesa. I like that European ideal that the time spent at the table can linger without all of the weekday requirements. Good stuff happens over meals. 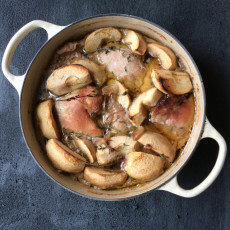 Katie Quinn Davies captures that sense of revelry and occasion in her latest cookbook, What Katie Ate on the Weekend… My first impulse upon thumbing my way through the book leapt out as surprise. Her popular blog, What Katie Ate was one of the early forerunners in blogging to really maximize moody photography where the shadows and darkness play as much of a role in the shots as the food itself. 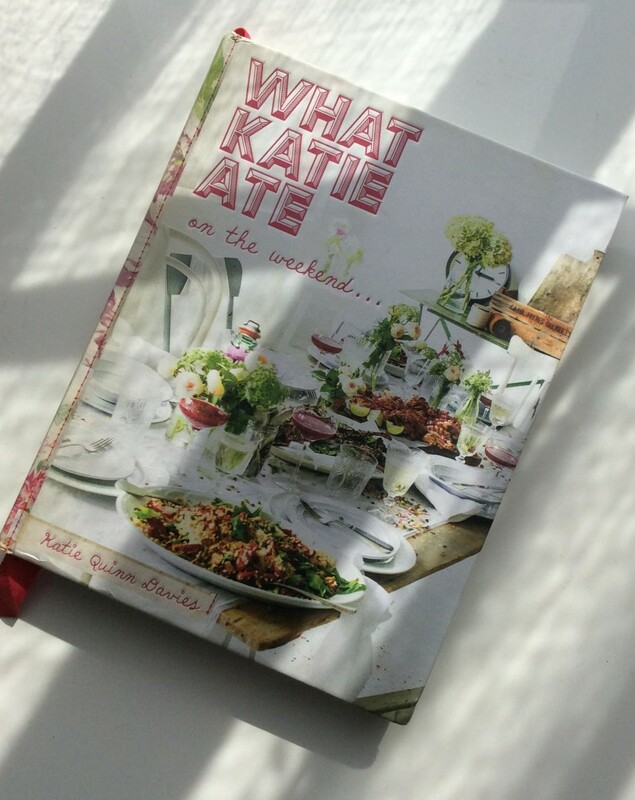 What Katie Ate on the Weekend is full of brightness, light dripping off of the pages. Some cookbooks I collect for the recipes, others for the stories. This cookbook is all about the photos. Davies won a James Beard award for the photography in her first cookbook. So, it goes without saying that the photography will be enticing. And, it is. But looking at the cookbook as part of a larger package, the design choices are intriguing. Full page photo collages get splashed with modern chunky typography. The design and layout are key to bringing the sheer quantity of photographs spanning the pages of this cookbook. The design is busy and fun, even down to the bright pink and white polka dot grosgrain bookmark, and conceptually this design suits the book because Davies herself is busy and fun. While weekends may relish lounging around a table, they also welcome road trips and excursions. She invites the reader into several weekend journeys around the world and brings them to the table with recipes featured in that excursion. The book acts as travelogue and scrapbook with imagery setting the scene of place scattered throughout the book, jettisoning the reader to places like Dublin and the Barossa Valley. The sections break out into the kinds of categories you would expect for gatherings like Party Food and Drinks. You get the impression she likes to throw fetes and wants you to join in on the fun since recipe yields tend to extend the party through larger sized results. Several recipes stood out. Her Eggplant and Mozarella Lasagne (page 206) substitutes thin slices of eggplant for the noodle layer, which makes it like the best version of eggplant parm possible. My sweet side eyed the Self-Saucing Mocha Pudding (page 278)– my pudding affection is legendary in our house. But the recipe I kept coming back to, the one that made me pause over its brief method and easy assembly was the Pomegranate Chicken, which I lightly adapted. Davies’ Pomegranate Chicken recipe calls for 12 pieces of chicken thighs, but instead I substituted a Japanese eggplant with its slender, long purple body and several yellow and green-striped tiger figs for roughly half of the chicken, opting to marinate the side accountrements with the chicken for a fuller flavorful meal. While her initial yield for the recipe serves 4 to 6, I changed that to 3 to 4 since there isn’t as much chicken. Trust me when I say you will devour the eggplant and figs right off the griddle. There’s a pretty good chance I’m going to make the marinade again and just marinate a heaping ton of eggplants and figs. I sweat the eggplant using the colander and salting method before tossing the rinsed eggplant chunks into the marinade. For the figs, I opted to use ripe tiger figs with jammy raspberry middles. You could also use black mission figs to great effect here too. 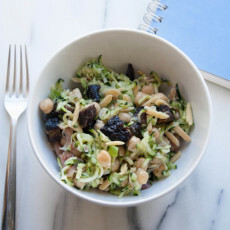 The idea behind the adaptation was to invite other Middle Eastern ingredients into the marinade, thinking their contributions would add to the party. Because isn’t that one of the beauties of planning soirees, thinking about the guest list and who might hit it off with whom, the kinds of conversations that might happen with the right conglomeration of friends? Indeed, the sweetness from the figs, lush softened eggplant and savory chicken combine with tart pomegranate molasses and frizzled mint leaves for a highly memorable meal. We served it with sliced beets, pistachios, and a relish of ginger, chive, and mint. All of the flavors melded together so well and started our weekend on a celebratory note. Thanks go out to Penguin Random House for sending the book to review. In a glass measuring cup with a spout, whisk together the oil, lemon juice, garlic, mustard, vinegar, mint with a dash of salt and pepper. Place the chicken, figs, and eggplant into a large zip seal bag. Pour the marinade into the bag and squeeze out any air, zipping it shut and jostling the chicken, figs, and eggplant so they are all coated. Place the bag in the refrigerator, ideally overnight. Heat a grill pan over medium-high heat until hot. Working in batches, use tongs to add the chicken, figs, and eggplant to the pan to cook for six minutes on each side or until the chicken is golden brown and cooked through. The eggplant and figs will cook faster than the chicken, so once they soften at the touch of the tongs, flip and cook the other side, removing from the heat once both sides have cooked through. 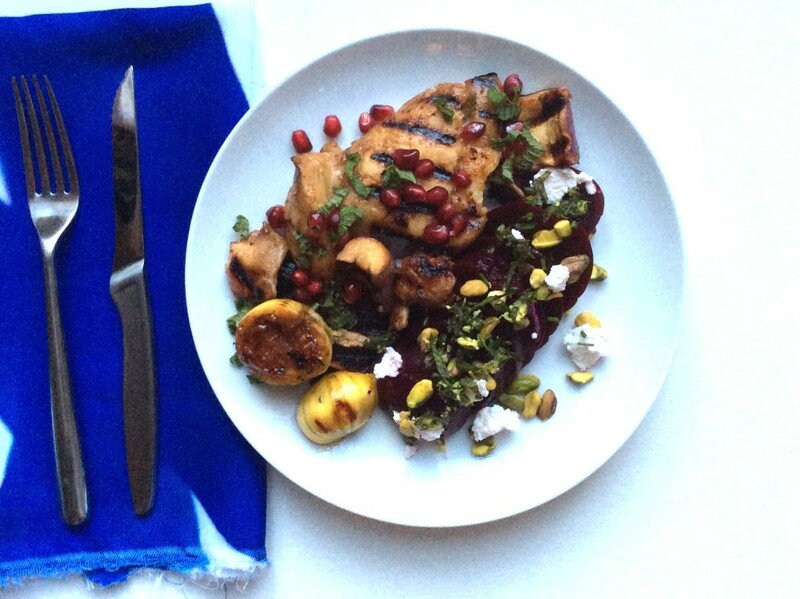 Sprinkle the mint leaves and pomegranate seeds over the chicken, figs, and eggplant to serve. Pomegranate and chicken.. what an interesting mixture! 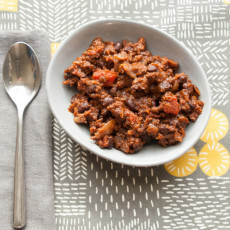 I’ve been using recipes from the Paleo Grubs Book (http://paleolunch.net/best-paleo-cookbook/) but this is one of my new favorites! Pomegranates and chicken have won me over. This would be quite tasty with cauliflower rice too. Thanks for visiting, Paleo Lunch.